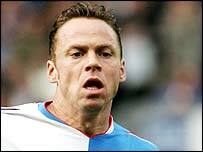 Paul Dickov headed a late equaliser as 10-man Blackburn denied Norwich their first Premiership win of the season. Norwich led through Mathias Svensson's first goal of the season, a low volley past Brad Friedel on 55 minutes. Rovers were already a man down after Jay Bothroyd's impetuous kick on Mattias Jonson earned him a straight red card after only 43 minutes. But Rovers pressed, and after Nils-Eric Johansson's header hit the bar, Dickov popped up to equalise on 86 minutes. It was cruel on the home fans, who were so close to celebrating a long-awaited victory - but the equaliser was no more than Blackburn deserved for a gritty second-half display. The two struggling sides produced plenty of attacking play early on, with Norwich the brighter. After just four minutes Darren Huckerby's deep corner was headed back across goal by Craig Fleming and Svensson nodded the ball against the bar. Jonson then blasted a right-foot shot just wide with Friedel scrambling as Norwich pressed. Friedel was also called upon to smother a Damien Francis shot on 18 minutes, although Blackburn weathered the early storm and fashioned their own half-chances. But Barry Ferguson's blocked shot epitomised the efforts of both sides, who showed more commitment than finesse early on. An increasingly scrappy half was lit up by Francis who jinked into the penalty box to create a shooting chance, only to see Friedel athletically parry his deflected effort. But Blackburn improved as half-time approached, with Friedel's opposite number Robert Green needing to be equally alert to parry Bothroyd's drive from the left of the box. There was a repeat performance four minutes before the break, when an even better Bothroyd shot - this time from the right side - seemed to be arrowing in before Green got a fingertip to the ball. Bothroyd's next action was considerably less impressive, however. The young striker inexplicably swung a boot at Jonson's calf after an innocuous-looking tussle for the ball near the corner flag, leaving referee Steve Dunn no option other than to produce a red card. Jonson played on but was replaced at half time by young striker Ian Henderson. Blackburn began the second half positively despite their man deficit, with Reid forcing a smart stop from Green in the opening minute. But unsurprisingly, Norwich enjoyed the greater possession and finally broke the deadlock after 55 minutes as Svensson latched on to a loose ball in the box to fire a volley under Friedel from six yards. But the goal seemed to make Norwich more nervous and Blackburn - in particular Dickov - still looked capable of scoring. Indeed, it took a fabulous tackle from Craig Fleming to deny the Scot with 20 minutes remaining as he broke clear inside the box. Nine minutes later, Nils-Eric Johansson came even closer with a cracking header which came back off the crossbar with Green well beaten. But the pressure continued, and it was little surprise when Dickov headed Rovers a deserved equaliser on 86 minutes. Norwich: Green, Edworthy, Fleming, Charlton, Drury, Jonson (Henderson 45), Holt, Francis, McKenzie (McVeigh 79), Svensson, Huckerby. Subs Not Used: Mulryne, Ward, Helveg. Blackburn: Friedel, Neill, Todd, Johansson, McEveley, Emerton, Tugay (Flitcroft 73), Ferguson, Reid, Dickov (Stead 90), Bothroyd. Subs Not Used: Enckelman, Thompson, Douglas.